Claimed to be the biggest combine development in the last 30 years, Agco is on a mission to win customers with its new range of machines. James Rickard gets a preview. 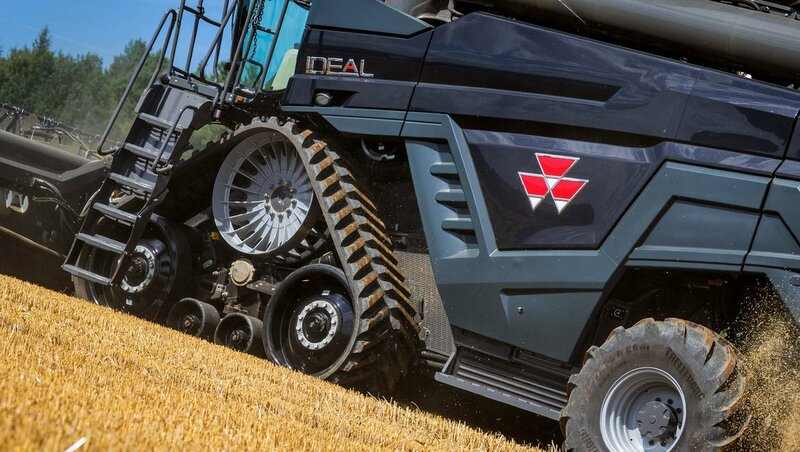 Agco says realistic outputs of 85 tonnes per hour will be possible for the largest Ideal 9 model. 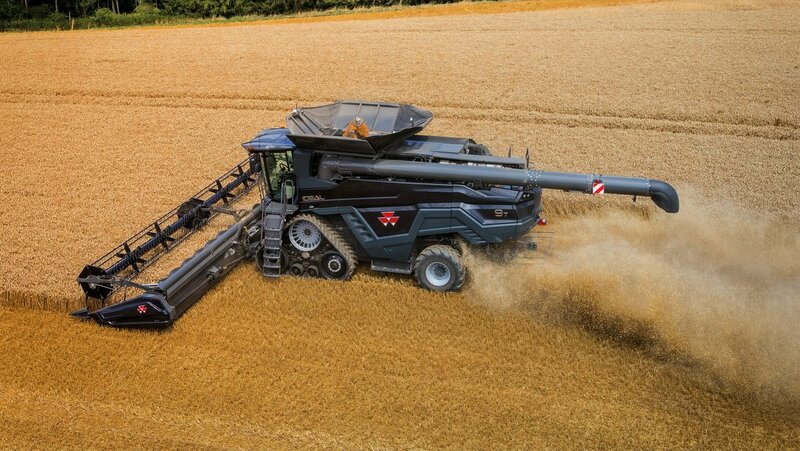 Aiming to put itself firmly back on the combine map, Agco has invested heavily in a brand new range of combines. New from the ground up, the ‘Ideal’ combine, yes, they actually called it Ideal, is the result of a six year project which added up to the tune of $200m, just on machine development alone. As a result, it is the single biggest product development Agco has ever made. Three models will initially be available, the Ideal 7, 8 and 9 (see overview box), with strong hints towards larger models to come. The model number relates loosely to the combine class system which is based on power and grain tank capacity. For comparison, the smallest 7 model is said to be roughly equivalent to a Claas Lexion 760, with the flagship Ideal 9 model claimed to be in a league of its own. We shall see on that one. In addition, each combine model can be specified with standard wheels, a levelling system for hillside work or tracks. The combines’ official launch will be at this year’s Agritechnica in November, with limited availability for next year and full availability for 2019. For the UK, the combines will be available under the Massey Ferguson and Fendt brands (Challenger in North America). Unlike the tractors, there will be no difference between the brands; they will even share the same standard graphite grey paint job. The manufacturer says spec for spec the two brands (MF and Fendt) will cost the same. Along with future possibilities of 50ft headers, the Ideal can unload grain at rates of up 210l/min. 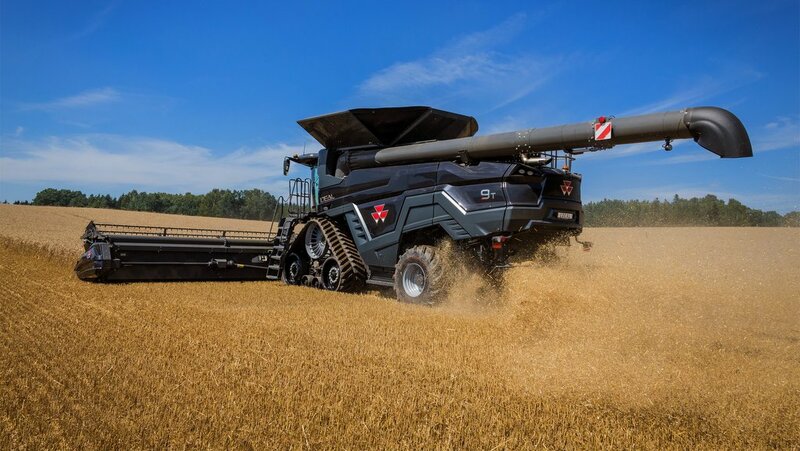 For the first time on a project, Ideal pooled together many departments of Agco, all with various roles to play in development; MF’s expertise in threshing, Challenger’s track knowledge and Fendt’s technology prowess, for example. The common ‘platform’ approach to development will see the combine produced and sold at various sites around the world. 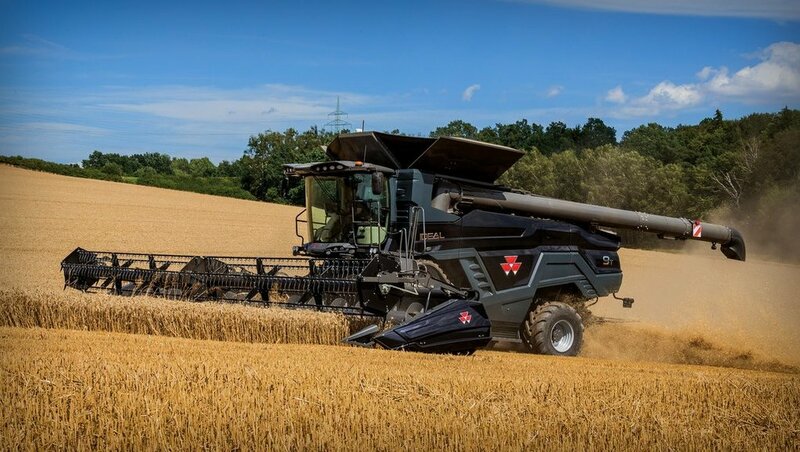 Breganze, Italy - Agco’s European combine HQ - will be the first site to start building the new machines with factories in South and North America to follow. Measuring 4.8m in length, the backbone of all three combine models are their longitudinal threshing and separation rotors. Whether the smallest model, which uses a single rotor, or the top two models, which use twin rotors, all three share the same rotor design. Designed to be gentle on both straw and grain and cope better with varying crop conditions, the rotors run at a lower rpm than their competitors, says Agco, using their length to provide effective separation. Along with a helical ‘finger’ separation layout, rather than a series of rasp bars, the manufacturer says power savings of up to 20 to 50 per cent can be achieved, depending on crop. Agco also claims straw length is typically 10 per cent longer, 80 per cent of which is more than 500mm. Rotors are effectively fed from underneath by a feed rotor, with straw discharged directly from the rotors into a swath or the chopping unit, unlike other designs which require another transverse rotor to transfer crop to the rear of the machine. In all, the 600mm (24in) diameter rotors offer 4.06sq.m of separation area. They are also reversible, allowing blockages to be cleared. Allowing for lateral hillside compensation of up to 15 per cent, the Ideal features a novel set of grain pans. With one pan collecting and channelling grain to the centre of the sieves, and one pan collecting and channelling grain to the outer parts of the sieves, grain is said to be distributed much more evenly across the width of the sieves, improving cleaning. In addition, cleaning starts at a much earlier stage in the combine, with sieves running a length of 2.2m under the rotors. The plastic pans feature very few moving parts and only weigh 22kg for the front pan and 55kg for the rear pan. They can also be easily removed, says the manufacturer. 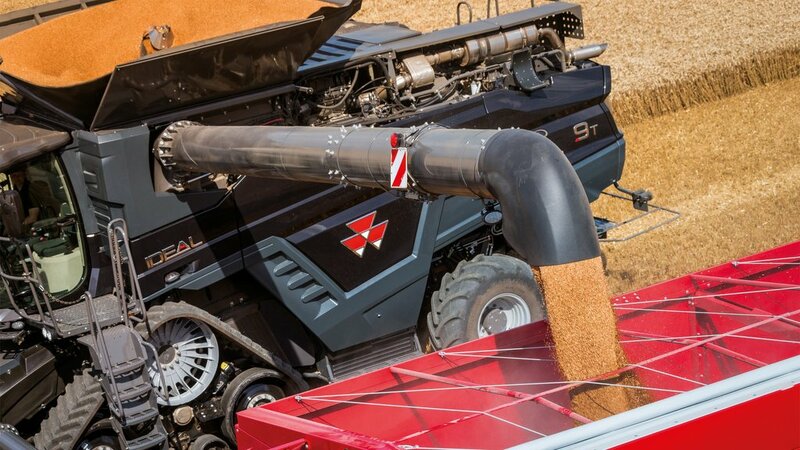 Agco reckons realistic and consistent combine outputs will be about 85 tonnes per hour for the flagship model. 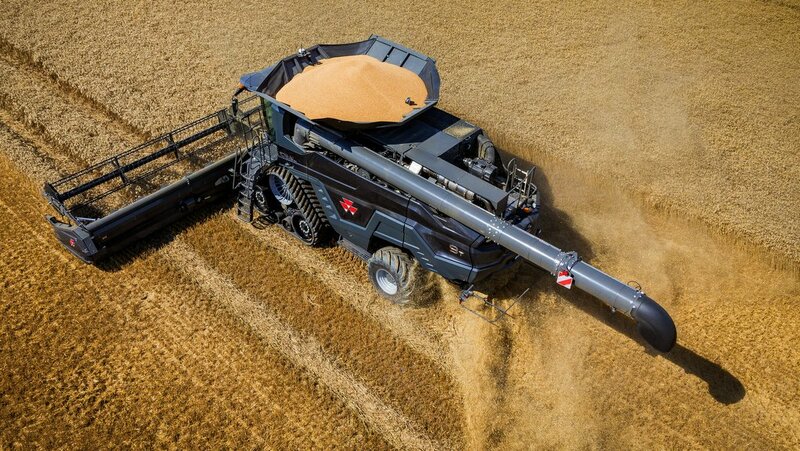 Up top, the largest model gets a massive 17,500 litre grain tank and the option of a 210l/min unloading system. The latter is said to only require the same power to drive as the firm's largest straw walker combine unloading system which has an unloading capacity of 110l/min. Throughout the combine are positioned 52 mass acoustic sensors, which use sound to determine what, where and how much material is moving through the combine. Of these sensors, 40 are used to measure material flow and load, with 12 used to monitor grain losses. The sensors allow real time crop visualisation via the in-cab terminal, showing how the combine is loaded up from front to back and from left to right. As well as the combines' 'ears', it also has eyes in the form of cameras which monitor grain quality. These allow grain to be analysed for any cracks or foreign material. 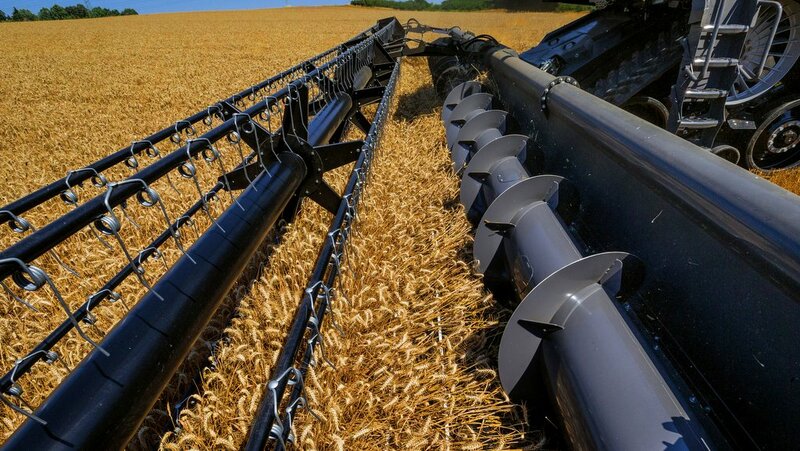 Using all of the above information, the combine has the ability to constantly and automatically adjust itself including rotor speed, concave distance, fan speed, sieves and ground speed. The user can also prioritise operational strategy to either minimise broken grains, minimise losses or maximise throughput. All this can also be done remotely via an app, allowing managers to keep a close eye on combine performance. A key feature of the combine is its transport width, which had to be kept narrow for many parts of the world. When fitted with 660mm-wide tracks or 800mm wide tyres, transport width is less than 3.3m. Other track options include 760 and 910mm-wide versions with transport widths of 3.5 and 3.8m respectively. To spread the load, the footprint of the 660mm track option is 2.4sq.m. The track unit has been developed in house and features an ‘open’ triangle frame design featuring multiple articulation points for improved ground contour following and comfort. Large diameter idler wheels are also said to create less rolling resistance, therefore requiring less power to get going. Getting power to the wheels or tracks is a two-speed hydrostatic transmission, capable of 40kph. Sharing a similar style to its Fendt Katana self propelled forager is Agco’s Vision cab. The Bavarian similarities continue with the Fendt-derived armrest controls and touch screen terminal. The latter takes care of all combine settings, guidance and documentation, and has the ability to be slid out of the way for better visibility to the header. In addition, a smaller screen is also incorporated into the armrest for quick combine information. The combines' feeder house has been designed to lift 6.5t, allowing it to be fitted with large headers. Currently, header options only go up 12m (40 feet), however, 13.7 and 15.2m (45 and 50 feet) headers are already in the pipeline, says the manufacturer. The feeder house features tilt capability and it can be specified with an auto docking system, which allows headers to be attached without leaving the cab.